Future devices from Apple could be built with a super-durable and light material like carbon fiber, but could also be available in a variety of colors thanks to a composite laminate surface. 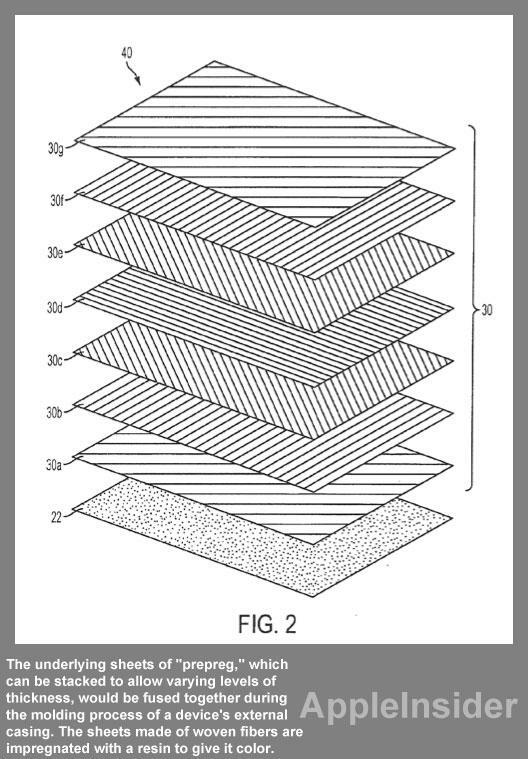 Apple's concept for coloring carbon or even glass fiber devices was revealed this week in a patent application published by the U.S. Patent and Trademark Office and discovered by AppleInsider. Entitled "Composite Laminate having an Improved Cosmetic Surface and Method of Making Same," it describes a composite laminate placed over the frame of the device, including a "scrim layer," to allow a product like a MacBook Pro to be painted a variety of colors. The application notes that carbon fiber composites offer many benefits, as they can serve as a strong, lightweight housing for electronic equipment. But carbon fiber composites are also typically black, and the fibers themselves are usually visible on the surface of the device. Additionally, Apple said the fibers of such material are usually variable in construction, offering a varied appearance on the surface. As a result, carbon fiber can feature cosmetic imperfections that would reduce the aesthetic appearance of a device. "Further, carbon fiber composites, often being black, provide a narrow range of surface appearance to the molded article and therefore may give a 'tired,' unexciting look," the application reads. Apple's solution is a composite laminate that includes a plurality of sheets that could be colored. These sheets would be formed of fibers pre-impregnated with resin. The composite laminate surface placed on the outside of the device could allow it to retain a color, and an exterior scrim layer would give a device enclosure a "consistent and pleasing cosmetic surface," Apple said. The underlying sheets of "prepreg," which can be stacked to allow varying levels of thickness, would be fused together during the molding process of a device's external casing. The sheets made of woven fibers are impregnated with a resin to give it color. The application, made public this week, was first filed in September of 2009. The proposed invention is credited to John Difonzo and Chris Ligtenberg. Apple has shown interest in adopting carbon fiber for its devices for years. As far back as 2008, the company was said to be looking at the possibility of using carbon fiber to build a lighter MacBook Air, though those plans never panned out. 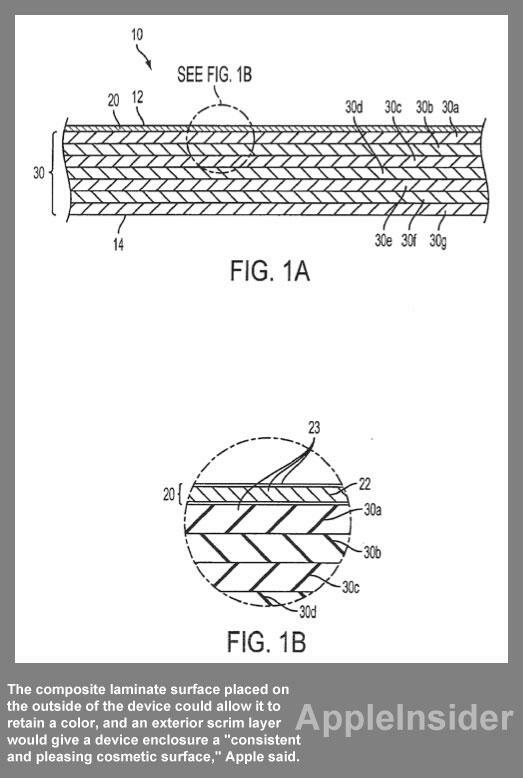 The company's continued interest in carbon fiber was demonstrated in a patent application in 2009 in a 9-page filing. In fact, the latest 8-page application made public this week is a division of that separate filing, first made in October of 2007. And last year, yet another patent filing showed a new iPad with a carbon fiber reinforced housing. That application likely helped to fuel rumors that the iPad 2 would have a carbon fiber body, though the final shipping product stuck with an aluminum exterior. In the iPad application, Apple described molding a supportive spine to a carbon fiber skin for a unique implementation of the material, in order to address issues where carbon fiber can crack or break if bent or rolled in a certain way. The company noted that devices with a metal back are durable, but can be heavier and more expensive.